As summer rages onward, celebrating the urban outdoors is now safer and more enjoyable via parklets: mini parks that extend outward from the sidewalk and into the sphere of pedestrian access. These reclamations of urban space have appeared in cities across the United States and are transforming the way people interact with streets formerly dominated by automobiles. They are also a great example of private organizations and businesses partnering with city government to improve public space for everyone. 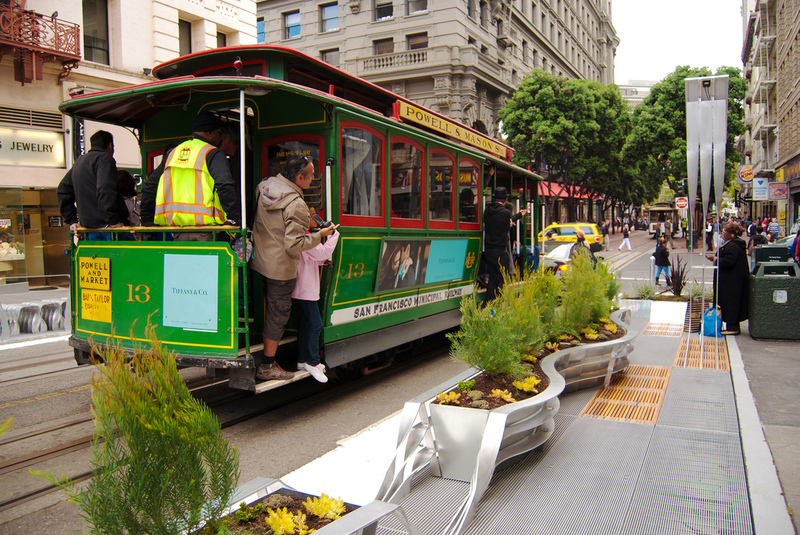 San Francisco was one of the earliest adopters of a parklet program. Two years ago the city began permitting businesses and community organizations to sponsor parklets up to two parking spaces wide, with sponsors paying for construction and maintenance. These little bursts of open space are spread across the city and range from modern brushed-metal and hardwood designs to more bucolic spaces dominated by murals and plants. Chicago has also been similarly intrepid with its Make Way for People initiative. The program is broader in scope than San Francisco’s, converting not just parking spaces but also alleys and “excess asphalt areas” into public seating and park space. Parklets created under the program are funded by public-private partnerships, with funders ranging from neighborhood Chambers of Commerce to Kickstarter campaigns. Whether its a sun ensnared day in The Windy City or bitterest winter, taking back the sidewalk has never been better. An ambitious, scaled up example of just how innovative parklets can be is Philadelphia’s brand new “The Porch”. The project creates a 50-foot wide, block long plaza replacing a parking lane and underused sidewalk beside 30th St. Station, one of the America’s busiest train stations. Like the many parklets created in San Francisco, the Porch is not a purely public project. Rather it is the creation of University City District, a community improvement and development organization. Since the Porch’s opening at the end of 2011 it has hosted free kick-boxing lessons, accordion recitals, and even circus performances, all in addition to providing public space to relax and enjoy the summer sun. Next time you arrive at 30th Street Station, your front door to the city has never been more accessible than its front “porch”.